Formal Training In The Use of FLEX Polishers & Polishing Systems. 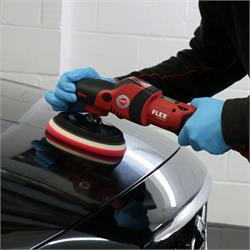 Manufactured in Germany to exacting standards, FLEX Machines Polishers are used worldwide by professional detailers and car care enthusiasts alike. Hosted at UF Studio, Brands Hatch, and delivered by Matt Back, FLEX authorised trainer, the FLEX Training & Certification Day is designed to introduce professionals to each polisher in the extensive range, including the standard, lightweight, and mini rotary polishers, standard and mini dual action polishers and the XC 3401 VRG, a forced rotation dual action polisher. Additionally, participants will have the opportunity to use FLEX's newest award-winning cordless machine polishers, the XFE15 150 Cordless Random Orbital and the PE-150 Cordless Rotary. Who's it for: Professional detailers seeking FLEX-certification.